There are two very powerful, and fully internalized ideologies in today's America: one is nationalism and the other is capitalism. Pope John Paul II once remarked that "pervading nationalism imposes its dominion on man today in many different forms and with an aggressiveness that spares no one." Whatever else you might think of this Pontiff, he makes a good point here -- and one applicable to the U.S.A. American politicians never tire of telling us that ours is the greatest nation on earth and, for the world's sake, we must aggressively (often by war) expand our freedoms, as well as our general culture, to the ends of the earth. Actually, this is a message that has been repeated for 200 years and "its dominion" here in the "land of the free" is manifest. For many citizens, this assumption is one of the primary reasons we invaded Iraq, are hanging on in Afghanistan, and swear eternal loyalty to the Israelis. It is probably the case that American political and civic leaders invoke God and national manifest destiny more than those of any other nationality. This is the world's prevalent economic system. It is based on private ownership of the means of production and the creation of goods and services for profit. Wage labor is an important element on the cost side of the capitalist ledger. So are things like safe working conditions and worker benefits. The capitalist impulse is to minimize costs in order to maximize profit. Left to themselves, capitalists will pay workers (white collar or otherwise) the lowest possible wages and deny or minimize other benefits. They will ignore worker safety and deny any responsibility for worker health. The only reason these important aspects of the workplace prevail is because of the pressure put upon the capitalist system by unions on the one hand, and government regulatory agencies on the other. If you want to maximize the probability of economic breakdown, just destroy all effective government regulation of the economy and outlaw unions. 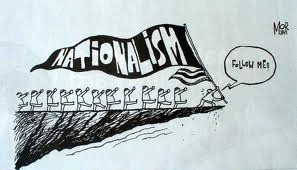 Nationalism and capitalism are quite different ideologies, yet somehow Americans have conflated them. Take a list of what are considered the best things about Capitalism: equality, achievement, freedom, growth and even happiness, and then compare them to a list of things considered the best about America: equality, opportunity for personal growth, freedom, a longer and fuller life. What do you know! They're almost the same. This is odd and not a little illogical. Why so? Well, consider the fact that these ideologies operate in opposition one to another. And do so right out in the open. Here is a good example. On 11 July 2012, Fred Grimm, a columnist for the Miami Herald wrote a piece entitled "This column was made in the U.S.A." In it he notes that "last year the Wall Street Journal surveyed employment data from a number of the nation's heftier corporations...and found that while they were cutting their domestic workforces by 2.9 million over a decade, they had hired 2.4 million people overseas." What sort of jobs are being exported by American corporate executives with, one assumes, the approval of their largely American stockholders? It turns out that they are not just your mundane factory floor jobs. They also include the work of: accountants, radiologists, architects, mortgage banking officers, computer technicians, and journalists (outsourcing the writing of local news stories to underpaid reporters in places like the Philippines). As the Wall Street Journal noted, this has been going on for a while now. Back in a 12 January 2004 edition of the Harvard Business School's online publication, Working Knowledge, James Heskett told us that "arguments based on accepted [those accepting are not named] macroeconomic theory generally come down in support of the free exportation of jobs." But then Heskett quoted Brad Leach's observation that "the real question is how to deal with the disproportionality of this impact: the broad, shallow, positive impact on product prices versus the narrow [sic], deep, negative impact on individuals." Well, it would seem that nationalism has met its match. It has been overwhelmed by that which lies at the heart of capitalism: profit. Thus, consider a hypothetical American corporation "A" which makes socks in town "X" and has done so for 100 years. At some point corporation A finds itself confronted with competition from cheaper socks made abroad and allowed into the U.S. by the millions of pairs because of laws placed on the books by free-market American Senators and Congresspersons. These foreign socks are being willingly purchased, instead of A's more expensive domestic brand, by red blooded American consumers. So the executives of corporation A face a serious problem. It does not take them long to figure out that if they move out of town X, where the labor costs are relatively high, and relocate to some foreign country with no unions or government regulations, their labor costs will go down and their competitiveness and profitability will go up. But to do so will destroy the economic basis of town X and the lives of its patriotic citizens who have loyally served corporation A for generations. So what do you do? Well, just ask the residents of all the defunct textile towns on the U.S. east coast from New England to the Carolinas. Very few entrepreneurs or their customers are going to admit that such issues as cost, profit and price are more important than every one of those things listed as the best of capitalism and nationalism. No, they will just ignore the distinctly second place status of equality, freedom, doing your best, growth and happiness, etc., and they will pretend that the economic destruction of workers' lives is an unavoidable consequence of commonsense business. Blame it on the natural laws of macroeconomics if you must. When the time comes for Mexican or Chinese or Indian workers to organize and achieve regulation of their industries so as to obtain decent wages and benefits, their lives in turn will be ruined as their employers run away to other places with lower labor costs, fewer required benefits and lower corporate taxes. For when it comes to the so-called commonsense demands of business, profits are more important than life itself (though not the financial well-being of the investors).